Atmospheric, ethereal, haunting backdrops all underpinned by hypnotic percussive grooves. 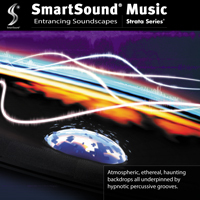 This uniquely flexible album gives you two completely different paths for music construction using SmartSounds Mood Mapping technology: Use the technology to reduce or eliminate the percussive elements to give your visuals a smooth, subtle, constant ambience, or, reduce or eliminate the melodic and harmonic instruments to bring out the percussion and propel your activity or storyline decidedly forward. The potential variety of uniquely creative takes from this amazing palette of tracks is limited only by your imagination.